At the time of writing this, the Black Panther is the number one grossing movie in Theatres and set box office records, proving once again Geek is Shiek. If you have not seen it yet make sure you catch a screening before too many spoilers are leaked. Comic Cons are popping up all over and it is hard to decide which one to go to if you can not make it to all of them. 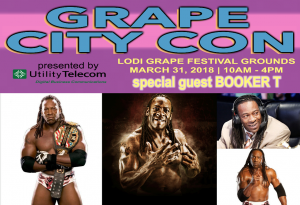 You will not want to miss Grape City Con at Lodi Grape Festival Grounds March 31st. Grape City returns for the fourth year. 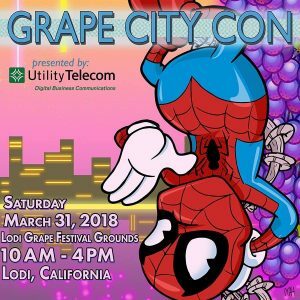 Grape City is one of the best single-day conventions in our area and brought to us by the same people who put on Stockton-Con and Central Valley Con. Tickets are $5 in advance and $8 at the gate, kids under 12 are free. You will be sure to find something to buy with over 150 exhibitors and artists. Take pictures with all our local Fan Club groups representing Star Wars, Walking Dead and all the other Cosplayers(remember to ask first before taking a picture). 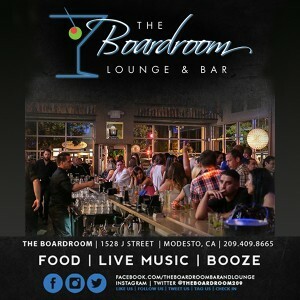 Meet Voice Actors Greg Berg and Brian Cummings, 6X World Wrestling Champion Booker T, Robert Mukes(House of a 1000 Corpses) and more. Add a who’s who of comic book artists including Chris Marrinan, Mike Hampton, Mel Smith and Ramon Villalobos. As always there will be some great panels, one of the areas best Cosplay Contests and for the first time at Grape City Con Douggary Grant is bringing the Geek Fashion Show. Get your ticket at Invincible Comics or Utopia Games in Modesto and make plans to take the whole family or go with a group of friends.